Love the beach? We do, and picked Erie, PA as our first overnight stop on our Great Lakes adventure to explore one of the largest beaches on Lake Erie. We spent two nights in the Erie area and explored the beach, the town, and the surrounding area. Having been to Erie before, we were familiar with the beautiful Presque Isle State Park located just west of Erie in Mill creek township. Presque Isle is a sandy peninsula that has 13 miles of roads, 21 miles of recreational trails, 13 beaches for swimming, and a marina. 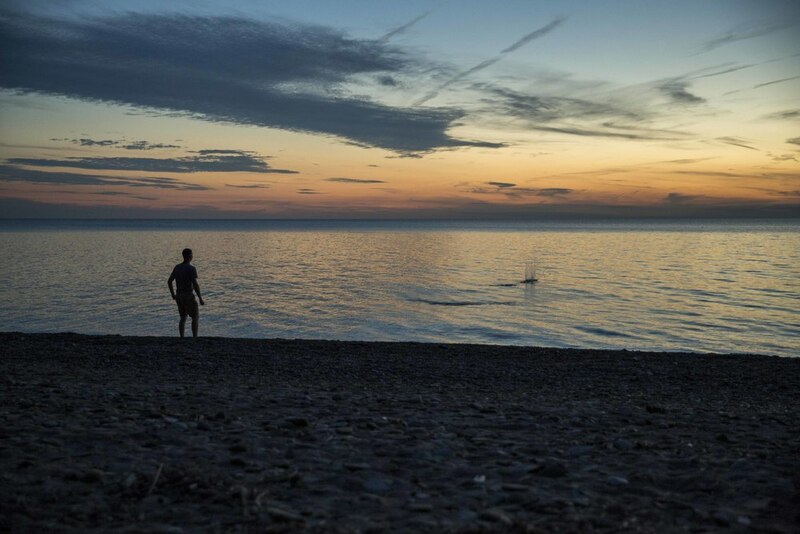 There is a lot to do on Presque Isle and we noted people paddle boarding, kayaking, biking, swimming, fishing, walking the beach, and overall enjoying the fun and natural setting. We spent our time enjoying the sunset, walking on the beach, swimming, and building a rock house garden. We wanted to be within walking distance of the beach and stayed at Sara’s Campground which is located at the base of the peninsula. 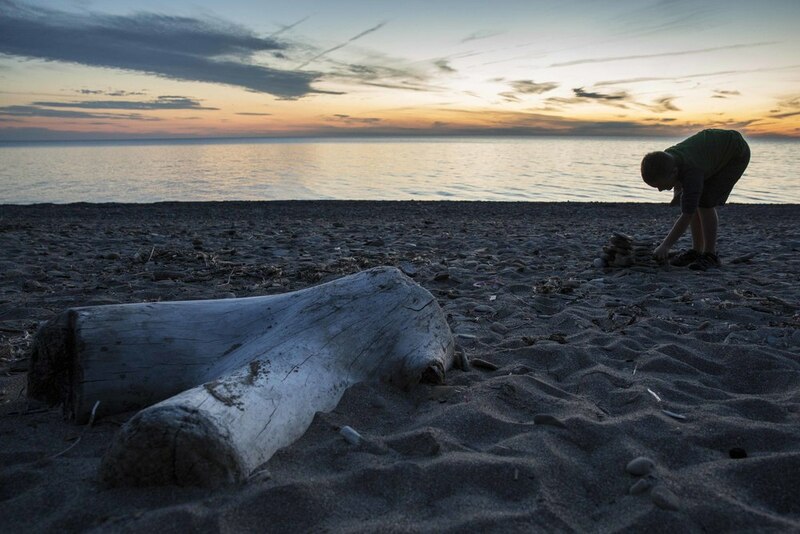 If you plan a trip to Erie and are primarily interested in enjoying the beach, we highly recommend staying near the peninsula… the Erie area is pretty big and busy, and some of the accommodations are far from the beach. If you’re interested in activities other than the beach, there are some fun options. Waldameer Park and Water World is a small amusement and water park located at the base of Presque Isle. Splash Lagoon, an indoor water park is located in Erie on Peach Street. The town of Erie quite large and has an urban feel. We spent an afternoon exploring and found a few gems that are worth the trip! Glass Growers Gallery 10 East Fifth Street is an awesome little store with art, jewelry, and other unique gift and décor items. The staff is very friendly and welcoming… when we walked in we were offered mini cupcakes… Daniel immediately liked the store! Just down the street from Glass Grower’s Gallery is Erie Children’s Museum. It’s open from 10 – 4 Tuesday – Sunday. We were too late for a visit, but from what we could see it looked great, especially for young children. We ventured across town to the Brewerie at Union Station located on 14th street. In addition to enjoying the craft beer and local wine, we loved the atmosphere… the building is really unique and packed with history. Union Station dates back to 1927, and much of the architecture is still intact. When the Brewerie opened in 2006, it wasn’t just focused on making and selling beer, it had a broader vision: “To help revitalize downtown Erie & the historic Union Station... one pint at a time.” Ten years later we saw a vibrant place with lots of people meeting and enjoying time together. Wondering about the food? The food is also good and they offer a kid’s menu. We’ll be back to Erie… it’s a close drive from Cleveland and offers lots of the things we like to do!